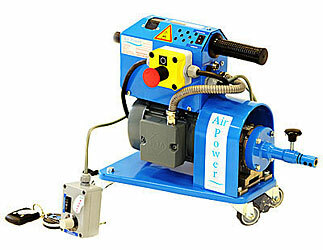 AirPower M2001 has been developed for air duct cleaning. Both round and rectangular ducts can be cleaned with the device, which is powered by a remote controlled 0,37 kW electric cylinder gear transmission motor. Thanks to its small size, the brushing device is easy to use and move around. The frequency converter controlling the AirPower M2001 motor has, despite its small size, many efficient features required for a reliant and convenient usage. The converter sustains momentary overloads, and is also protected against over current, over voltage and memory faults. AirPower M2001 is a handy cleaning tool for Ø 100 – 500 mm air ducts. AirPower M2001 can be equipped with brushing heads for rectangular ducts. Flexible bidirectional rotating axles are manufactured as tailor work. A wide variety of brushes is available for most purposes and objects. AirPower M2001 fulfills the CE requirements for the European Community area, and is thus suitable for safe usage in all operation environments from small houses up to requiring hospitals.